Multi-platinum selling music artists, Demi Lovato & Nick Jonas, appeared at the Honda Press Preview event during New York Auto Show week today to announce they are headlining the 2016 Honda Civic Tour. The Honda Civic Tour Featuring Demi Lovato & Nick Jonas: Future Now is promoted exclusively by Live Nation and launches June 24, 2016 in the Miami area. Demi and Nick will take their highly anticipated tour to 37 cities throughout the U.S. including New York, Los Angeles, Chicago, Las Vegas and more. A full list of tour dates is below. “We want our fans to step in to our worlds and to feel like they’re a part of Honda Civic Tour: Future Now from the moment they enter the venue ’til the moment they leave,” says Demi Lovato. Tickets for the 2016 Honda Civic Tour are on sale now. Starting at noon PDT today through midnight on March 28, a special Buy 2 tickets, Get 2 ticket offer will be available at Honda.us/2for2. To redeem the offer, fans can enter the special access code “DemiNickCIVIC” upon checkout. The Honda Civic Tour also invites fans to power up their concert experience with The Power of Dreamssweepstakes. Starting today through August 27, one lucky ticket holder and a guest at each show along the tour will be selected for the ultimate backstage VIP experience, including an arena tour, a look inside Demi’s and Nick’s tour bus, a chance to walk on stage prior to the show and a private meet and greet with Demi and Nick. Fans can enter for their chance to win at Honda.us/tix. 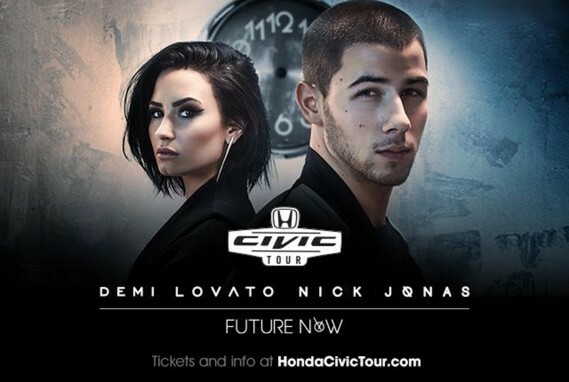 Continuing in Honda Civic Tour tradition and starting today through February 2017, fans will be able to enter to win a brand new 2016 Honda Civic Sedan designed and autographed by Demi Lovato, a Honda Grom motorcycle customized and autographed by Nick Jonas or (thanks to Honda Financial Services) a trip to the tour finale at The Forum in Los Angeles on September 17. More info and rules for all sweepstakes can be found on HondaCivicTour.com. Singer/songwriter Demi Lovato’s current album, CONFIDENT, is out now on Hollywood Records/Island Records/Safehouse Records and features the hit songs “Cool for The Summer” and the title track “Confident.” Her newest single is the power ballad “Stone Cold”. In addition, Demi is playing Smurfette in the upcoming animated feature GET SMURFY. Island Records/Safehouse Records artist, Nick Jonas introduced himself as a fully formed solo artist on his hit self-titled debut, released in November 2014. The critically acclaimed album includes hits “Jealous,” “Chains” and “Levels.” Currently in the studio working on his new album, Nick also stars in “Kingdom,” and will appear in the upcoming James Franco produced film GOAT, which premiered at Sundance to incredible reviews. 2016 marks the 15th Anniversary of the Honda Civic Tour. Over 4.2 million fans have attended Honda Civic Tour since 2001 to see 68 artists including One Direction, Maroon 5, Linkin Park, Fall Out Boy, Panic! At The Disco, blink-182, The Black Eyed Peas, Incubus and more.